Facebook is a social network which was created in 2004. It’s an intensely popular site that can enable you to make connections, share interests and like groups. Facebook has over 955 million active users, with an overwhelming half of these active users accessing Facebook on a mobile device. There are multiple benefits to having a presence of Facebook as a business. It allows you have high levels of engagement and good public relations with previous, current and prospective customers, In addition it allows you to creates a great platform to display and market what you have to offer. With access to features such as Event Pages, where you can create an event that is occurring within your company, if you have a promotion running throughout a particular month, or images and videos of recent exhibitions all of these can easily be publicized on facebook to your growing audience. 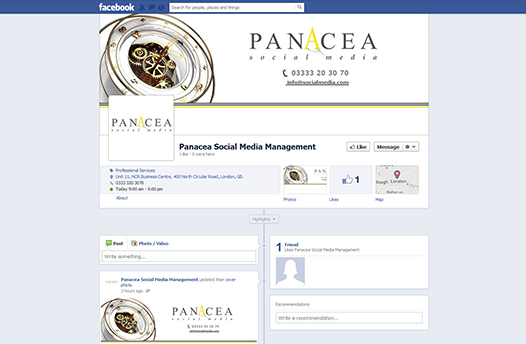 At Panacea Social Media we have years of experience to deliver exceptional standards with a service that strives on getting results. We manage the updates, analysis, monitoring and implementation of all the Facebook activity so you don’t have to worry. We can measure how many individuals your messages and posts are reaching, and even the level of engagement of your pages.